Beauty Mountain is an upland area of cliffs and boulders along the rim of the New River Gorge four-miles east of Fayetteville, West Virginia, in northern Fayette County. Rock climbers have popularized the location globally. 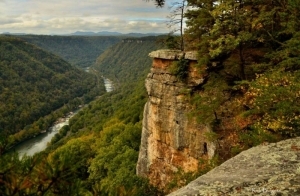 The cliffs provide unmatched overlooks of the New River in its gorge, part of the most popular rock climbing destinations in the eastern U.S. The cliffs are located with the boundaries of the New River Gorge National River. The rock layer that forms Beauty Mountain is of the resistant Nuttall Sandstone. Hundreds of climbing routes ascend its face, including some of the highest and most difficult routes in the New River Gorge region. Many house-sized boulders approach the brink of its cliffs. Areas similar to Beauty Mountain, larger and smaller versions, outcrop elsewhere on the rim of the gorge. The Endless Wall climbing area, the largest, is located to the northwest of Beauty Mountain. As with other climbing areas in the gorge, sandstone with a multitude of vertical cracks and striking features are secondary attractions: the incredible views and the large and active climbing community make the Beauty Mountain area a prime climbing destination.